When the United States entered World War I, both native-born Americans and immigrants were called to serve their country. Among the list of Exeter’s veterans, the names of German, Russian, and Polish immigrants are found beside the names of families who had been in town for generations. 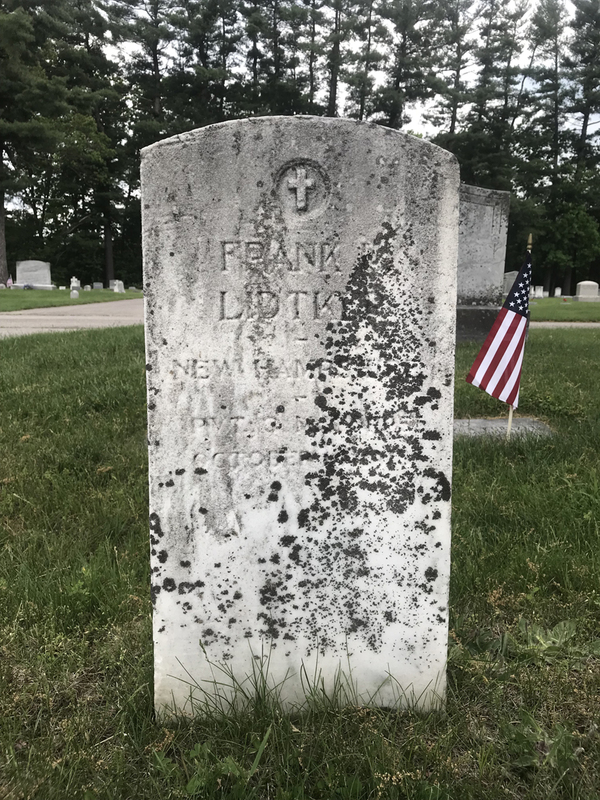 This Memorial Day, we remember Frank Litdker, a German-American Exeter resident who lost his life in the Great War. 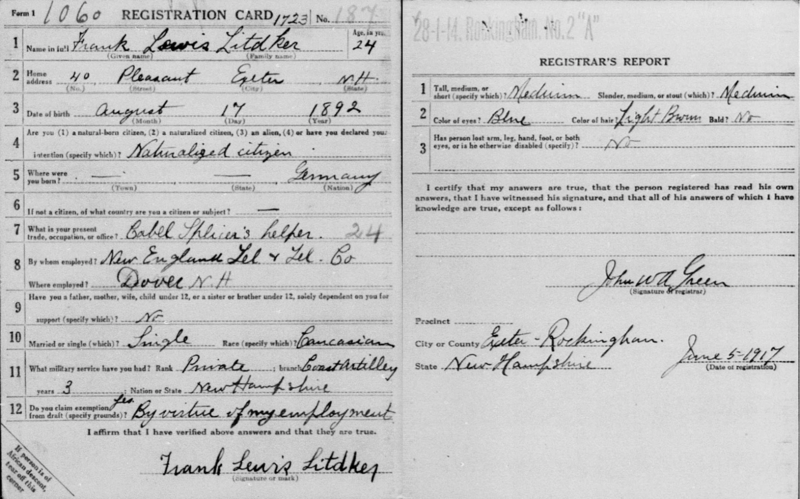 Born in Germany in 1892, Frank Litdker came to the United States with his parents and grandparents some time around 1894. Soon after arriving in the U.S., the family unofficially changed their last name to Lake. By 1910, the Lake/Litdker family was living in a household of 13 extended family members - mother, grandparents, siblings, and cousins - on Jady Hill Avenue. The Jady Hill neighborhood was home to a number of immigrant families who were mainly employed in textile work at the nearby Exeter Manufacturing Company. Litdker’s family was no exception, with mother Amelia and sons Frank and August working respectively as a carder, weaver, and spinner. When the first draft was called in 1917, Litdker had taken a new job in Dover, working as a cable splicer’s assistant for the New England Telephone and Telegraph Company. 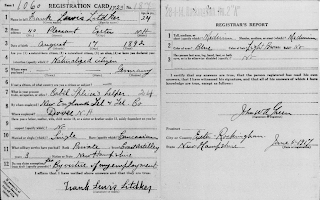 When he registered for the draft on June 5, 1917, Litdker claimed exemption “by virtue of my employment.” Even early in the war, telegraph work was important war work. The War Department had contracted with various large telegraph and telephone companies to create a direct communication network between D.C. and all U.S. military operations, domestic and overseas. Later in the war, President Wilson would issue a proclamation to “take possession and assume control of each and every telegraph and telephone system, and every part thereof, within the jurisdiction of the United States.” However, as the situation stood in 1917, Litdker’s skills as a cable splicer were valuable to the war effort, and were legitimate grounds for exemption. As the war continued, it became apparent that additional skilled workers were needed for military work overseas. A statement in the Exeter New-Letter on April 19, 1918, reported that “the government urgently needs for its military service at least 12,000 men skilled in various trades. This offers an excellent opportunity for men of draft age to choose congenial service.” At the same time, a training camp of the National Army Training Detachments was set up at New Hampshire College in Durham. Litdker’s name was called under the second draft, and on July 1, 1918, he left Exeter with several other men to train at the Durham vocational camps. Likely due to his work experience, Litdker was assigned to the Electrician’s division at Durham, where he trained for military work for several months. Because the National Army Training Detachments’ philosophy was one of hands-on training, Litdker and other trainees practiced their trade by wiring several New Hampshire College buildings. This work was considered a great service to the Durham community. He also likely trained on the camp’s six telephone poles, and would have learned to install signal wires in the camp’s model trench. It is unknown when Litdker sailed for France. Training at New Hampshire College typically lasted eight weeks, so he likely left in early September 1918. Once overseas, Litdker was assigned to the Quartermaster Corps. The disease is extremely infectious. Its mode of spreading is not entirely clear, but that it passed from person to person very early in the disease there can be little doubt. That it may be, and is, spread in other ways is very probable. A Red Cross message received here Wednesday announced the death in France of Mr. Frank Lake, an Exeter man in service overseas. He was married here five months ago. The Armistice was declared just ten days later, on November 11, 1918. Litdker’s wife, Lucy Heidke, gave birth to a son, Frank Lewis Leidtker, on March 10, 1919. 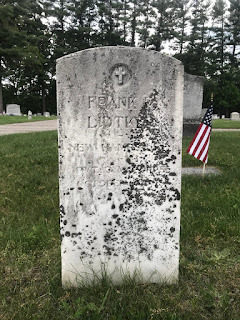 Litdker was buried in the Exeter Cemetery, in the Leidtker family plot (for their final memorial, the family had re-adopted their name’s German spelling). His grave is marked by a marble headstone, issued by the War Department, listing his name, home state, rank, and date of death. **Note: Although Frank Litdker’s name is listed alternatively as Lake, Lidtker, Litdker, and Leidtker, I am using the spelling Litdker, as that is how he chose to identify himself on his draft card. Jillian Price has a Master's degree in history from Northeastern University and is a regular volunteer at the Exeter Historical Society.